A consistent regimen of yearly cat & dog teeth cleaning is one of the most effective ways to keep your pets healthy and extend their lives. In honor of National Pet Dental Health Month in February, we offer a Pet Parent’s Guide on why pet dental care is so important, and how it helps keep your pets healthy. Most dental disease in your pets occurs under the gum line where you can’t see it. 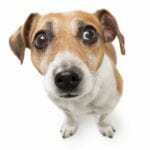 One of the most common health conditions in dogs & cats is peridontal disease. 80% of dogs and 70% of cats have peridontal (gum) disease by the time they are 3 years of age. Medical research shows gum disease negatively affects organs and the immune system. There’s substantial medical research that shows why cat & dog teeth cleaning is critically important to the health of your pets. In recent years, plenty of medical research has shown that there’s a link between the health of your pet’s mouth and the health of their organs and immune system. Periodontal disease in pets starts when plaque and tartar form on your pet’s teeth…due to lack of brushing and lack of professional pet teeth cleanings. When plaque forms on your pet’s teeth, it results in a build-up of damaging bacteria. This bacteria will first attack your pet’s gum tissue and the roots of their teeth, resulting in rotting teeth, infected, painful teeth & gums, and tooth loss. As the bacterial infection progresses, it can enter your pet’s bloodstream via the blood vessels in or near their gums and teeth. As that bacteria travels through your pet’s bloodstream, your pet’s immune system perceives the bacteria and starts an inflammation response, leading to swollen red gums and systemic inflammation. Since the bacteria is traveling through your pet’s body through the blood stream, it will negatively affect organs with the highest blood flow as it passes through them. As a result, your pet’s heart, kidneys, liver, lungs, and brain can become infected, while also compromising the immune system. All of this can compromise your pet’s health and shorten their lives. A professional teeth cleaning, done under anesthesia at the veterinary hospital, is the most effective way to care for your pet’s teeth & maintain their health for the long term. Scraping the tartar & plaque off the visible part of your pet’s teeth using a tool called an ultrasonic scaler. Pet Parent Note 1: To perform these procedures humanely, it’s necessary to put your pet under anesthesia. This minimizes their stress and fear, keeps them from suddenly shifting position while their teeth are being cleaned with sharp instruments, and keeps them from feeling any discomfort. Pet Parent Note 2: The recommended schedule of cat & dog teeth cleaning is once a year. Besides getting a regular cat or dog teeth cleaning for the pets in your household, the number one action you can take to keep your pets’ mouths healthy at home is to brush their teeth. 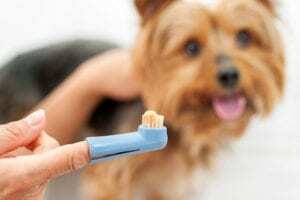 Here are some tips on getting your pet accustomed to brushing their teeth. Step 1: Buy a flavored pet toothpaste. Do not use human toothpaste, especially any brands with fluoride in them. Fluoride is harmful to pets when swallowed, just as it is for small children. Step 2: Pet-specific toothbrush. Buy a full-size pet toothbrush and a “finger” toothbrush that fits over your finger and has soft bristles. Step 3: Pet-specific toothpaste. Put some pet toothpaste on your finger and let them taste it and get used to it. They may not like the first flavor you buy. Try one. If they like it, use it. If they don’t like it, try another flavor. Typical flavors for pet toothpaste are beef and chicken. Step 4: Try the finger brush first. Put some toothpaste on it, gently insert under your pet’s lips without aggressively pulling their lips back, and gently rub across their teeth. Don’t try to do a whole brushing first; start in small increments of time. Step 5: Praise when done. Once done with the finger brush, praise, give treats, or offer a play session as a reward. Step 6: Next, introduce the toothbrush. Add toothpaste, gently lift your pet’s lips, and gently brush their teeth top and bottom. Keep it short for starters, and then praise them and give treats or playtime. While you may not have time to brush your pet’s teeth daily, try for 2-3 times a week, once your pet is accustomed to this process. 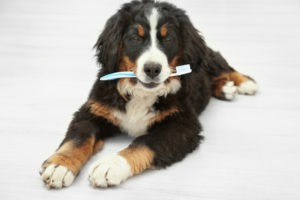 Home Pet Dental Care Quick Tip 1: Schedule tooth brushings at the end of the day, or after play time or a long hike. When they are tired, they will be more likely to accept this process, especially in the early stages. Home Pet Dental Care Quick Tip 2: A fantastic source for checking out reviews of dental products for pets is the website for the Veterinary Oral Health Council: www.vohc.org. We get a lot of questions on a new procedure promoted as “anesthesia free teeth cleaning” for pets. 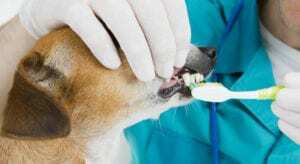 While anesthesia free dental cleaning sounds like a good deal for you and your pet, this is a trendy and dangerous procedure that has been universally rejected by veterinary societies worldwide. What is Anesthesia Free Pet Teeth Cleaning? Anesthesia free pet teeth cleaning is not really teeth cleaning. Rather, it only involves scraping the tartar and plaque off the visible part of your pet’s teeth so their teeth look better. But this procedure does not result in a healthy mouth. With anesthesia-free dental cleanings, your pet is not put under anesthesia but they are heavily restrained so a worker (not necessarily a veterinary technician or veterinarian) can scrape tartar and plaque off the visible part of your pet’s teeth. In a true teeth cleaning, the dental cleaning work is done on visible portions of your pet’s teeth and under the gum line where the bacteria resides. Cleaning under your pet’s gum line is critical to creating a healthy mouth and a healthy pet. This does not occur in an anesthesia-free teeth cleaning for pets. These trendy procedures are being promoted and offered mostly at pet stores and grooming salons. 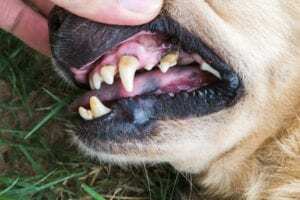 What Are The Dangers of Anesthesia Free Pet Teeth Cleanings? Exposes Your Pet to Unnecessary Pain: Without anesthesia, your pet will feel pain or discomfort when their teeth are being scraped, especially near the gum line. Puts Extraordinary Stress on Your Pet: Your pet will be aggressively held or tied down with restraints. That alone will put them in a place of fear and/or panic. When a stranger then starts scraping their teeth and causes pain and they can’t escape, their fear increases exponentially. If you put a rescued pet who’s been abused through this procedure, you will re-traumatize them. The Procedure Can Cause Dangerous Spikes in Heart Rate & Blood Pressure: When you aggressively restrain an animal, they will be stressed. When you add an uncomfortable & painful procedure while they’re being restrained, you run the risk of causing your pet to have dangerous spikes in their heart rate and blood pressure. 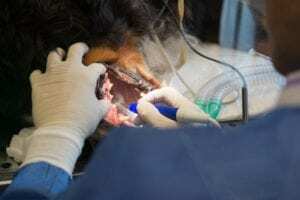 This Procedure Does NOT Result in a Healthy Mouth: One of the biggest problems with anesthesia-free teeth cleanings is that they create a false sense of security that pets have a healthy mouth. Again, the visible portion of your pet’s teeth will look cleaner. But the real dental care that protects your pets is the dental work that’s done under their gum line to reduce bacteria. Work under the gum line cannot be done while a pet is awake. Veterinary Dental Societies from: Austria, Belgium, Britain, Canada, Croatia, Czech Republic, Finland, France, Germany, Ireland, Japan, Italy, Netherlands, Norway, Poland, Portugal, Romania, Russia, Slovenia, Spain, Sweden & Switzerland. One of the best ways you can ensure a long, healthy life for your pets is consistent dental care that includes cat or dog teeth cleaning once a year, under anesthesia, at your chosen veterinary hospital. When you add home dental care in the form of weekly brushing of your cat’s or dog’s teeth, this goes a long way to preventing plaque and tartar build-up that leads to bacterial infections. Considering getting some dental care or a cat or dog teeth cleaning for your pets? 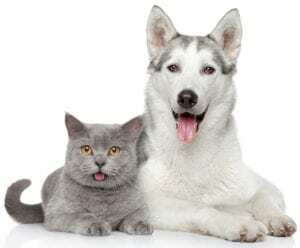 Please get in touch with Sky Canyon Veterinary Hospital, in Grand Junction, Colorado, to schedule a pet dental cleaning. Sky Canyon Veterinary Hospital can be reached at: 970.985.4911, or Email Us.